A New Fashion Exhibit at the Valentine Takes a Glimpse at Richmond's Most Notable Arts Patrons | Arts and Culture | Style Weekly - Richmond, VA local news, arts, and events. 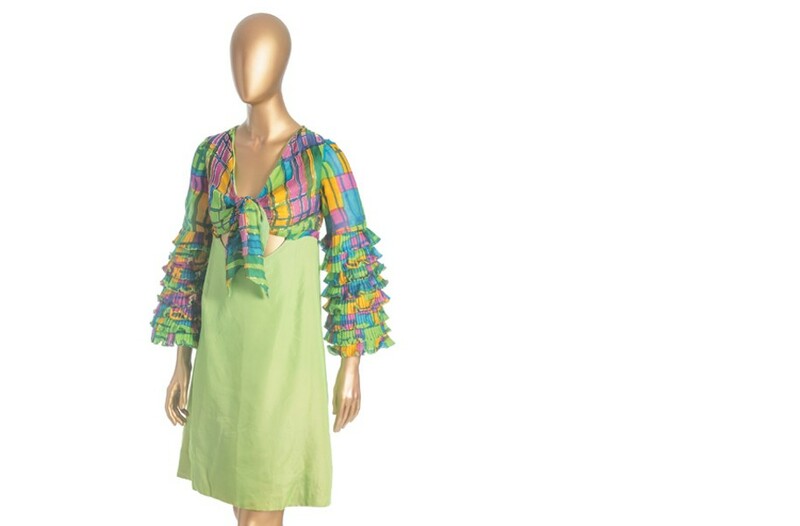 A gypsy cocktail dress from 1970 by Sandra Kemp, the first woman to graduate from Virginia Commonwealth University’s fashion design program. Grooviness aside, the handcrafted patches of colorful fabrics and assorted patterns were never intended to cover holes. Rather the creatively arranged shapes sewn on 1970s jeans with intentionally naive stitching were a fashion statement, with only the frayed hems of the flared legs giving testimony to their well-worn status. Richmond’s longtime love affair with the arts is told through the lens of fashion and textiles at the Valentine’s new exhibit, “Our Hearts on Our Sleeves.” For those not artistically inclined, clothing and fiber art offer an affordable and accessible means of creative expression. Voyeuristic types may also find it a fascinating peek into the closets of some of the city’s notable art patrons. Back when fine art wasn’t considered a viable professional path for women, fashion design provided a more acceptable expression of creativity. Sandra Kemp, the first woman to graduate from Virginia Commonwealth University’s fashion design program, is represented in the show with a gypsy cocktail dress that’s just as much a knockout today as it undoubtedly was when designed in 1970. The elaborately ruffled bell sleeves and a bodice that ties in front of a half-moon peek-a-boo detail sit atop a simple green sheath with a jolt of color — jewel tones in a orange, green, blue and pink plaid. Melody Gulick’s well-documented paper dress for Pam Reynolds anchors a display case of showstoppers. A backless gown designed by Felix Henri van Driem for Rejena Carreras to wear to a Fabergé event at the Virginia Museum of Fine Arts sports a host of intricately designed Fabergé egg details. Immediately recognizable is Franco Moschino’s playful silk suit for Frances Lewis — the fabric’s pattern is taken directly from a Roy Lichtenstein painting. A Sara Sue hat, once sold in Miller & Rhodes — which was given to the Valentine museum as a gift by Sara Sue Sherrill Waldbauer. Art lovers may also recognize the hats by Sara Sue. 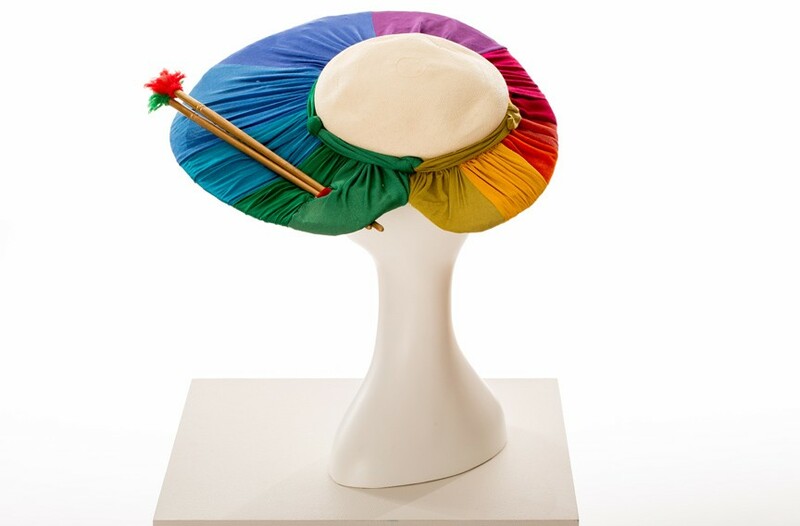 Designer Sara Sue Sherrill Waldbauer, who sold her hats in the Amethyst Room at Miller & Rhoads, created them for a fashion show that was inspired by art masterworks. The hats were copied from a work by Pierre Auguste Renoir at the art museum. As difficult as it is to imagine now, the museum loaned the Renoir piece to Miller & Rhoads for the fashion show. “That would never happen today,” Stewart says. It’s an indication of the role of department stores at the time. “They were a place to go as a source of entertainment, but also a source of cultural education. To get the joke of the mannequins in those hats, you had to have some art proficiency,” she says. Another example is an embroidered sampler, titled “Invitation to Lafayette,” stitched by a girl to mark the occasion of the French aristocrat’s and American Revolutionary general return visit in the 19th century. Stewart points out that needle craft was long denigrated as women’s work before its validity as an art form was more recently recognized. The final gallery focuses on contemporary fashion and fiber art such as Danielle Weinstein’s “The Iron Maiden,” a breathtaking chain mail top and long skirt, created while the designer was still a student at VCU. Like other distinctive pieces in the gallery, it was only meant to be worn once, in this case to 1708 Gallery’s Art to Wear fashion show in 2004. “Our Hearts on Our Sleeves” runs through Jan. 28 at the Valentine, 1015 E. Clay St. thevalentine.org.